Autumn is a wonderful time to get outdoors and give your garden a timely refresh. The sun is out, the leaves are a beautiful orange and the weather is lovely and mild. Summer temperatures have dropped right off but Winter is still far off in the distance. Which means one thing – the time is ripe for a bit of landscaping delight! Your soil will still have some warmth left over from the heat so it’s a good time to plant new vegetables. Garden beds can be planned and primed for later. Importantly, Autumn also the best time to prepare for Winter to ensure your garden gets through the ice and rain with ease. There’s plenty to be done, and if you tick off some boxes now you’ll get to enjoy your garden from afar come Winter (the other side of the window with a warm cuppa). Unlock the shed and sharpen your favourite gardening tools. There’s work to be done! 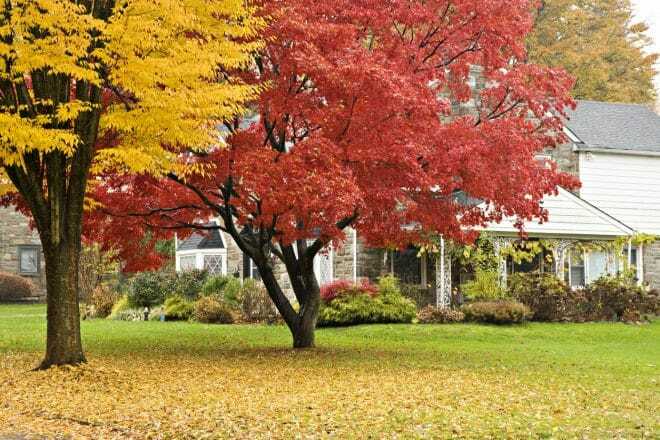 Here are 6 Autumn landscaping and gardening tips to get you started on your refresh this season. Pruning removes the dead branches and offcuts from your trees and helps improve their health and appearance. A heavy tidy-up is recommended in Autumn to protect against damage from storms, hail and even ice in Winter. It’s also a good idea to do a quick Winter gardening review when June starts. Wait for a sunny day to get it done and turn it into a family event. Pruning is a fun activity with friends (if you can rope them in). It’s a key chore to keep your garden beautiful, and you’ll thank yourself a few months later. Compost bins are the perfect way to save fallen Autumn leaves. They’re simple to make and do wonders to bring out the best in your soil in the future. If you don’t already have one, we recommend purchasing a bin instead of starting a compost pile. It will keep your compost tidy when the rains hit next season. To start your own compost started, gather your grass clippings, kitchen scraps, leftover pruning cuts and leaves together. Thrown them in and alternate between the garden debris and scraps. Turn it all with a garden fork often to circulate the air and help decompose it all down nicely. Autumn is a great time to design and plan that new garden bed you’ve had on your mind all Summer. Do the preparation now and you’ll get a jump start on seed planting in Spring. If you need to do any building or ask a landscaping expert for advice, now is the time to do it. Where will you put the garden bed? Is there access to water nearby? What do you need to build – is it going to be raised? Planting a tasty new vegetable garden doesn’t need to wait until Spring for some varieties. If you live in the South East of Australia, leafy vegetables will grow well in Autumn. Root vegetables and herbs also come up nicely. Here are some vegetables you can start now to enjoy during the season (and get your planting fix before Winter): green beans, peas, spinach, parsley, thyme, coriander, garlic, oregano and tarragon. Rain always makes the idea of spending time outdoors a bit grey – let alone the thought of entertaining. But what about building your own enclosed space to enjoy year-round? If you have space, an alfresco area could be the answer to staying in touch with nature during the Winter months. An outdoor enclosure can be simple to plan and cheaper than you think to build. Not only will it protect tables, plants and pots from the elements, but also provide you with shelter, shade and privacy. Winter get-togethers just got a lot cosier. You should fertilise your lawns twice a year to keep them healthy and green. Autumn is one of the best times to do this, to keep them protected over the upcoming Winter months. You won’t want to spend much time outdoors when it’s cold and bleak, so we recommend giving the lawn a good mowing too. Spray any last weeds sprouting up to finish it off. If you tick some of these Autumn landscaping boxes off, you’ll be sitting pretty and can relax knowing your garden is primed for success. That’s never a feeling that gets old – particularly when those Winter blues hit! If you would like some help planning out your Autumn landscaping and gardening projects, give the experts at Everlast a call today.